Gratitude turns what we have, no matter how much or how little, into plenty. Invite family and friends to gather around the table and enjoy the perfect holiday feast to celebrate your many blessings together. A delectable turkey ready to be carved is surrounded by all the trappings of an appetizing Thanksgiving meal. Waiting to be eaten are corn, carrots, pumpkins, and more. Thanksgiving blessings abound. Let the beauty of gratitude fill your heart and overflow into others. 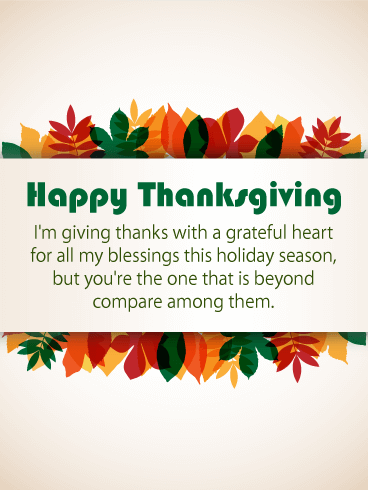 Share this gorgeous Thanksgiving card with someone special. It is a thoughtful way to let someone know you cherish them and are thinking of them this Thanksgiving. Send a warm Thanksgiving wish for others to be surrounded by loved ones, and their bellies full of tasty food! If you're looking for a heartfelt Thanksgiving greeting card, this one is for you. 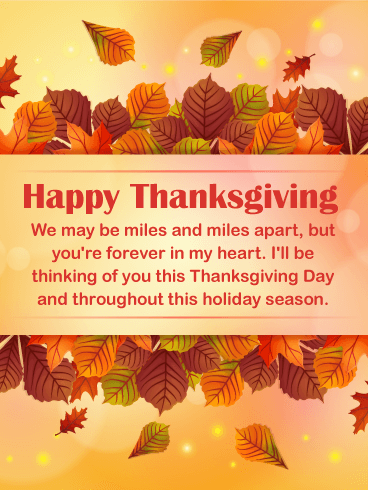 Those who are miles apart but thinking about friends and family this holiday season will want to send this Thanksgiving card to loved ones. Set on a rich, creamy background, a smattering of leaves evokes images of jumping into raked piles of leaves as a child. 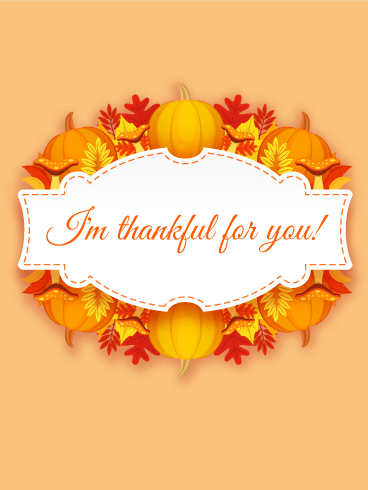 Keep those memories alive in hearts and minds with this card this Thanksgiving. A happy and heartfelt Thanksgiving greeting card! What's cuter than a turkey in a pilgrim hat on Thanksgiving? Not a whole lot! 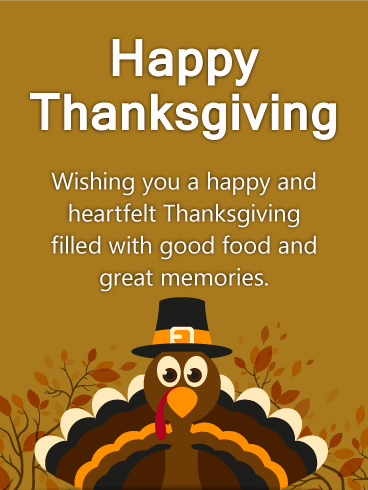 Send this fun Thanksgiving card and thoughtful holiday message today. It's the season to give thanks and count your blessings. Why not share a warm wish with someone near and dear to you? This turkey is ready to wish a happy thanksgiving to all your friends and family. Comfort is a homemade pumpkin pie. 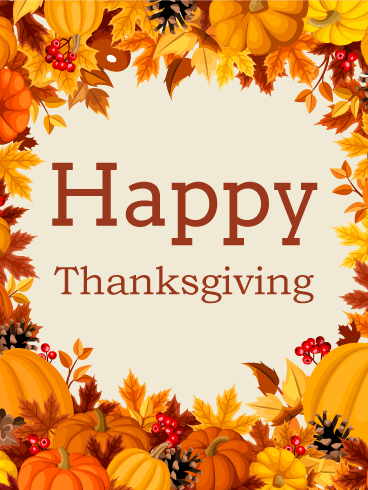 Wish comfort and joy to those around you this Thanksgiving holiday with a thoughtful greeting card. This pumpkin pie card is a real treat and a charming way to remind someone to enjoy all the coziness this holiday affords. When you send a Thanksgiving card, you're sending a smile and wish. When loving hands prepare us food, our spirits are refreshed. When loving friends send thoughtful cards, our hearts overflow! Of course, you're thankful for all your blessings, but you're uniquely thankful for someone. Tell that one special person how you really feel this Thanksgiving with this Thanksgiving card. Set on a white background, your message of love is surrounded by leaves of burgundy, gold, orange, and green. The turkeys are coming! Are you ready for food and fun? Send out your Thanksgiving greeting cards before you're knee deep in mashed potatoes! These cute turkeys make this the perfect Thanksgiving card to send to anyone. 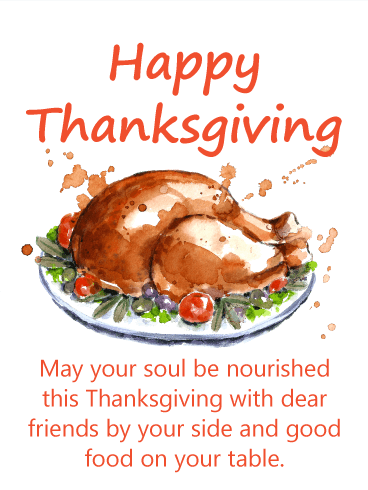 Put a smile on someone's face with a fun loving and happy Thanksgiving greeting card. 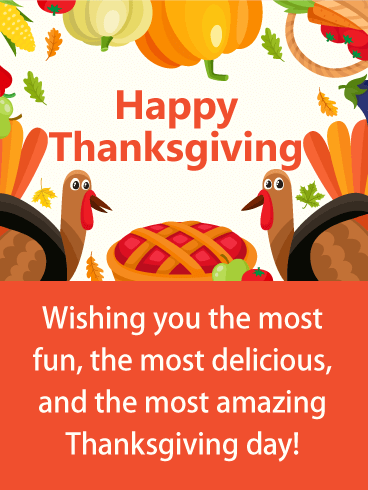 Sending a Thanksgiving card is easy as pie! Pumpkin pie! 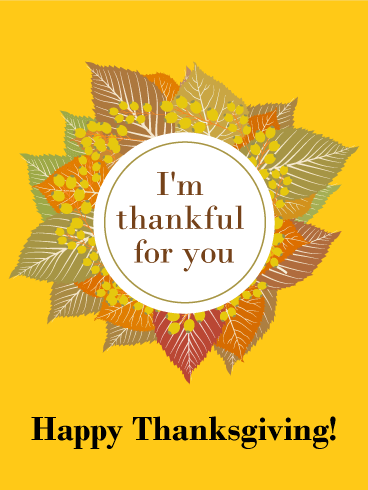 You're thankful for them today and every day, but on Thanksgiving you have the opportunity to tell them about it with this Thanksgiving card. Set on a tan background, your sentiment is surrounded by all the trappings of autumn - pumpkins, mushrooms, and leaves of myriad colors. Let them know exactly what they mean to you with this simple but meaningful message. Do you enjoy leaf peeping? This is the card for you. An abundance of leaves in the rich autumn hues of red, orange, and gold calls for a time of reflection on our many blessings. 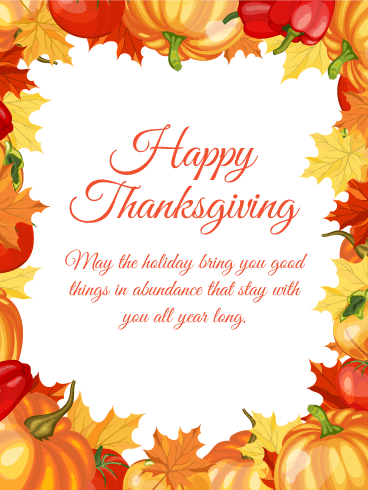 Let your loved ones know how much you care by wishing that their fortunes be more prosperous than the number of leaves falling each autumn with this Thanksgiving greeting. Gobble, gobble! Ain't Thanksgiving grand? 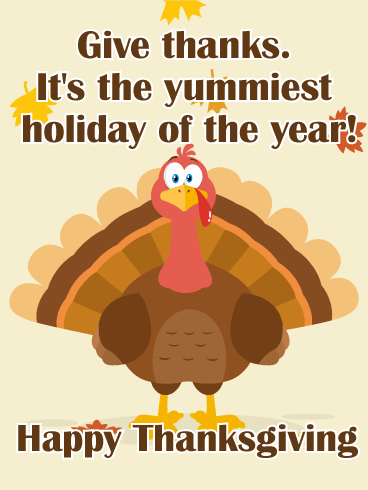 Turkey, mashed potatoes and gravy, pumpkin pie-yum yum yum! This Thanksgiving card is super thoughtful and super adorable. Don't be a turkey! 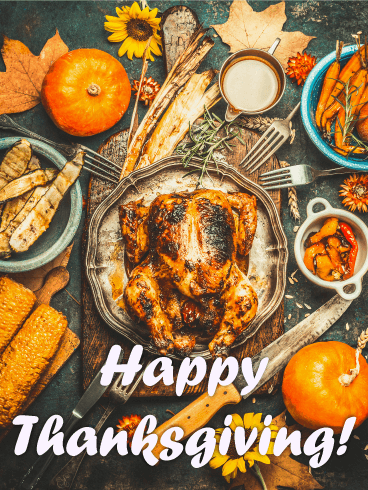 Send this cute Thanksgiving greeting card to someone special today and wish them a tasty holiday. Let this turkey trot on over and do the talking for you! Give thank with a grateful heart and send this thoughtful card today. I'm thankful for the beauty of the earth and the sky, but on this day I'm most thankful for you. 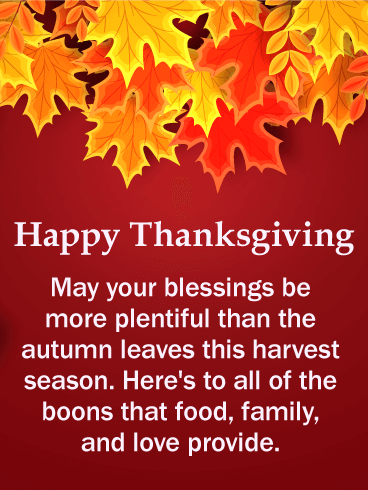 Set on a harvest gold background, this message of gratefulness is surrounded by a ring of autumn leaves in hues of brown, green, rust, and red accented with golden flowers. It's a perfect way to say you care on this day of thanks.